As part of its goal to promote financial inclusion on the African continent, Arise has partnered with FMO, the Dutch Development Bank and Above and Beyond Tech (a&b), a global technology company based in the U.S, on an exciting collaborative fintech initiative, FinForward. Arise is an African investment company that partners with sustainable, locally-owned Financial Services Providers in Sub -Saharan Africa to promote financial inclusion. 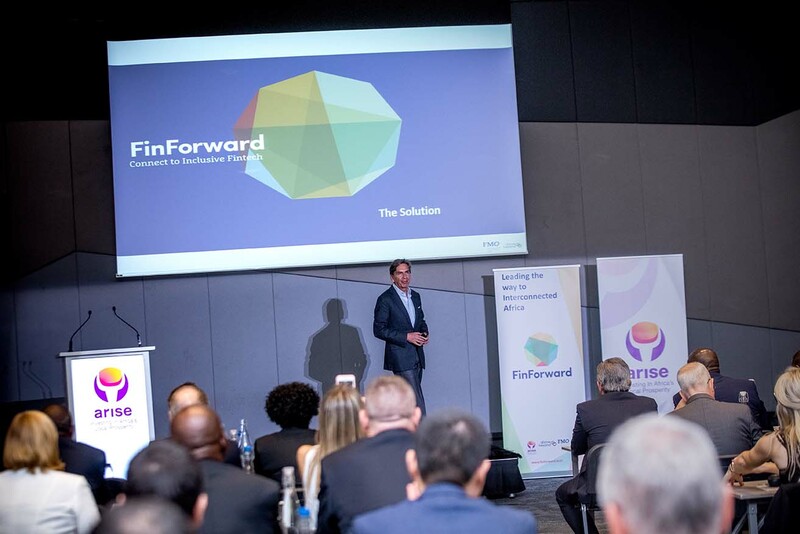 Arise CEO, Deepak Malik comments, “We are excited to join FinForward, which is aligned to our objective of accelerating the digitisation of the financial industry in Africa by supporting the innovation of financial institutions and mobile money providers’ core businesses with digital solutions. Together our goal is to drive responsible inclusive growth and make banking more accessible by leveraging fintech solutions”, he said. The FinForward program is powered by 4wrd, a&b’s proprietary platform, a marketplace integrating and matching African financial institutions and mobile money providers with fintech companies worldwide. The platform has been designed to ensure that global fintech companies are easily accessible to African financial institutions to help them to innovate, reduce costs, tap into new revenue streams and work towards opening banking platforms to promote financial inclusion. “Fintech is turning traditional banking on its head and is disrupting the way ordinary Africans manage their money”, said Malik. Digital innovation in banking offers potential rewards for banks and can lead to increased revenues from innovative offers and new business models. In addition, it can lead to lower operational costs from automation, digitisation and transaction migration. “Arise is in a unique position as it understands, both the need for digitisation in banks and how investing in fintech can meet these digitisation requirements. A strategic imperative for Arise will be to enhance the value proposition of banks in Africa through encouraging collaboration between fintech companies and banks through this program”, he added. FMO‘s Andrew Shaw, Senior Fintech Specialist indicated that “with the rise of fintech, the digital transformation of financial institutions has become inevitable and urgent. While many African institutions are aware and exploring this transformation, partnerships with fintech companies remain a challenging proposition. FinForward is the first program of its kind in Africa supporting collaboration between financial Institutions and fintechs through matchmaking and the digital integration by API technology. FMO and Above and Beyond Tech are proud to partner with Arise to increase financial inclusion and the efficiency of the continent’s leading banks”. “We are building a thriving interconnected global ecosystem integrated through one single platform”, added Jorge Ruiz, Co-Founder & CEO, Above and Beyond Tech. “The partnership between Arise, FMO and Above and Beyond Tech in Africa is designed to exponentially amplify the power of network effects. The possibilities for innovation are endless when you have a development bank, a leading African investment company and a global financial technology company working together to accelerate the digitisation of the African financial sector and support the growth of the region and its communities”, concluded Jorge Ruiz.